Russell Cyrus Hinshaw1,8,9,10 [Russell C. Henshaw6]. Hinshaw, Russell, head-of-household, age 25, born in Indiana; parents born in Indiana; first marriage, married 3 years; occupation: farmer, general farm; rented farm. 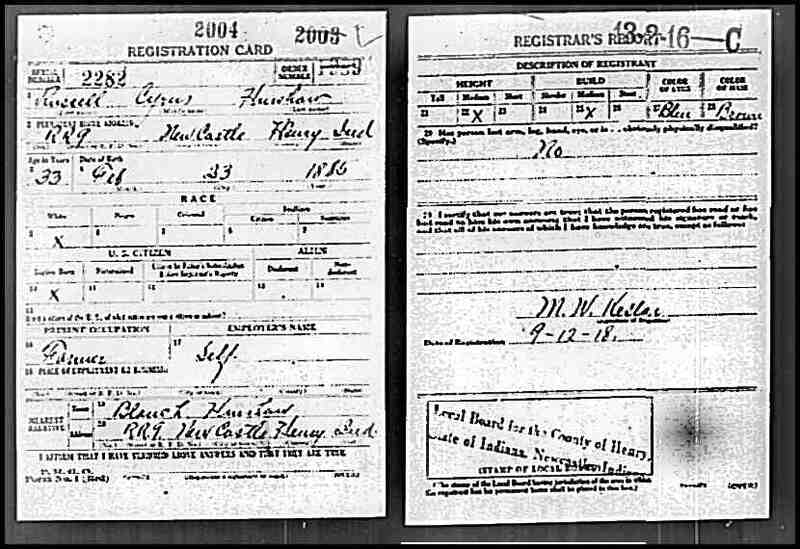 Hinshaw, Blanche H., wife, age 26, born in Indiana; father born in North Carolina; mother born in Indiana; first marriage, married 3 years; no children. Hinshaw, Russell, head-of-household, age 34, born in Indiana; parents born in Indiana; rented home; occupation: farmer. Hinshaw, Blanche, wife, age 36, born in Indiana; parents born in Indiana. Hinshaw, Vivian, daughter, age 7, born in Indiana; parents born in Indiana; attended school. Hinshaw, Hilda, daughter, age 3 years ? months, born in Indiana; parents born in Indiana. Hinshaw, Ralph C., son, age 1 year ? months, born in Indiana; parents born in Indiana. Hinshaw, Russel C., head-of-household, age 45, born in Indiana; parents born in Indiana; first married at age 22; owned home ($8000 value); radio in home; occupation: farmer. Hinshaw, Blanche H., wife, age 46, born in Indiana; father born in North Carolina; mother born in Indiana; first married at age 23. Hinshaw, Vivian, daughter, age 17, born in Indiana; parents born in Indiana; attended school. Hinshaw, Hilda, daughter, age 13, born in Indiana; parents born in Indiana; attended school. Hinshaw, Ralph, son, age 11, born in Indiana; parents born in Indiana; attended school. KENNARD -- Russell C. Hinshaw, 82, RR, New Castle, a lifelong resident of the Kennard community, died early Sunday morning in the Henry County Hospital at New Castle, after a short illness. Born near Greensboro, Feb. 23, 1885, he was the son of the late Lonzo and Mary Anna Barnard Hinshaw. Mr. Hinshaw was a very active member of the Greensboro Masonic Lodge, No. 175 and Eastern Star Chapter of Lodge No. 543, past master of the lodge, past worthy patron of the chapter, charter member of the Eastern Star No. 543 and of the Henry Co., Greensboro Twp. Farm Bureau. Surviving with the widow, Blanche, are two daughters, Mrs. Fred (Vivian) Rogers of Pendleton and Mrs. Hilda Fisher of Noblesville; a son Ralph Hinshaw of Frankfort; two brothers, Herbert Hinshaw of Kennard and Floyd Hinshaw of Spiceland; eight grandchildren; and seven great-grandchildren. Funeral services have been arranged for 2 p.m. Tuesday at the Condo and Son Funeral Home in Wilkinson with the Rev. Maurine Fisher, in charge. Burial will take place in the Glen Cove Cemetery at Knightstown. Friends are being received anytime at the funeral home where masonic memorial rites will be held by the Greensboro Lodge at 7 p.m. this evening and Eastern Star services will be held at 7:30 p.m. tonight. 1920 census, Greensboro Township, Henry County, Indiana; roll T625_437, ED 62, page 16B, line #70, dwelling #221, family #224. 1910 census, Greensboro Township, Henry County, Indiana; roll T624-355, ED 80, page 104B, line #59, dwelling #150, family #150. 1850-1920, Indiana Works Progress Administration; Book CC-12, page 262.